So you've run out of coffee filters and desperately need your coffee? Not to worry, there is more than one tried and true coffee filter substitute to rescue you. Using perfectly simple methods and materials you might already have on hand in your home, you will soon have caffeine running through your system. ​We've found 7 coffee filter alternatives for you. Have you ever made cowboy coffee? Not only is it an extremely easy coffee filter substitute, but tastes really good if made well! You don't need any special gadgets. Use 2 tablespoons of finely ground coffee per 8 ounces of water. Add water to a pot and bring it to a boil. If you have cheesecloth in the cupboard, fold it over itself a couple of times, cut it to fit your filter basket and filter the coffee through as usual. No further work is needed. 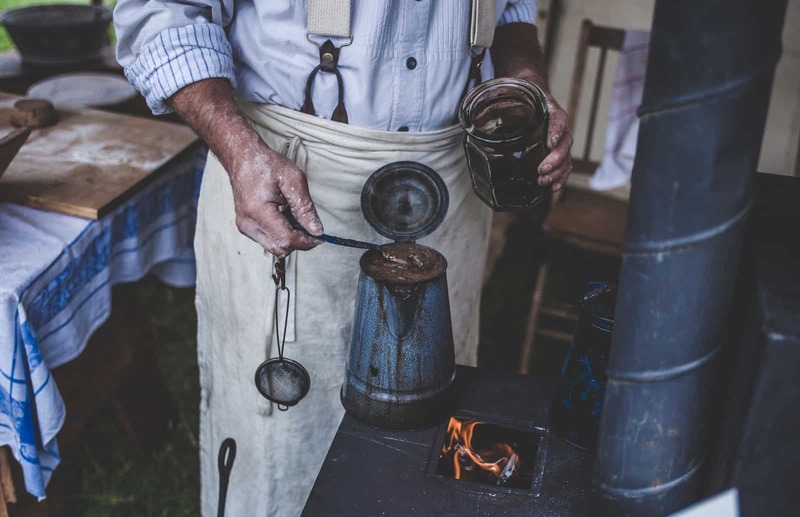 Believe it or not, one of the oldest and most widely spread methods is making coffee with a thick cotton sock or piece of muslin. It is also more environmentally responsible than coffee filters because you can simply rinse or wash your cotton sock and reuse it! Place your coffee grounds in the sock, hold it over a pot and pour the hot water. Alternatively, place the sock inside a pot, pour in the hot water and leave it to steep for a few minutes. Medium or coarse ground coffee works best. You can even use a handkerchief or pair of stockings, they also work just fine. Another delicious tasting coffee filter alternative is “mud coffee.” Just put one cup's worth of grounds in the bottom of your mug, pour in boiling water and stir a bit. The grounds will start settling. Wait a couple of minutes to let them settle fully, and you can drink nearly to the bottom without getting grounds in your mouth. If you drink milk in your coffee, add it after the grounds start settling. Do not stir the coffee after the grounds have settled or it will become gritty. This works best with finely ground coffee. Reusable metal filters are another excellent alternative and save you the cost of constantly buying paper filters. French presses and Stovetop coffee makers make a delicious brew, are fairly inexpensive and you don't need any paper filters to use them. It's also a good idea to have instant coffee in the cupboard in case you run out of filters, but It's also a good backup in case you run out of coffee beans. Paper towels can tear apart when exposed to high heat. Also, they're treated with chemicals that can affect the taste of your coffee. Regardless of which coffee filter substitute you use in your crisis situation, now you can make a backup plan for the future. So if there are any desperate mothers out there trying to get back in the school routine with three children. And you find yourself in this situation as I just did ?. Then you surely have a pair of pantyhose some where. But I highly suggest you rinse and repeat in hot water first! Being half asleep I didn't even think about the detergent and fabric softener that we're being filtered through the coffee and forcing me to give up.... thank God there is mountain dew ? Haha I had to smell every sock so I could find the perfect one. Then rinsed it out. Sock. Works like a charm if you have the time u can actually place the sock in the filter holder of your coffee machine after you tie a knot. Move your filter holder slightly so it doesn't pour into coffee pot. Let that container fill up with the hot water leaving about 1 cup of water for later. TURN OFF COFFE MAKER. Let the sock sit for as long as you like. Turn coffe maker on after reajusting your filter holder. Let coffee maker continue with the last cup. After brew is finished. Pour coffee back into the back as if you were going to make it agian. Let the coffee maker run through drain sock after. Caution sock will be hot.. . Hoping for some more great ideas. Instant Coffee Is The Instant Solution For Hot Drinks & Energy For Me!! I used paper towels when I ran out of filters. Never had a problem with them until recently. I ran out of coffee filters. Used paper towels for about a week. All of a sudden my coffee tasted like it had metal and other crap in it. I wasn't feeling all that well during this time. This morning I remembered an old unbleached (tamales come in an unbleached bag) piece of material I used in the past. It was still in the drawer. Used that again. No off taste. My coffee tastes great again. May not go back to filters ever again. I feel a heck of a lot better. Stay away from paper towels.